Mr. Fullarton is represented by The Compound Gallery in sunny and scenic Oakland, California. A fine selection of Mr. Fullarton's works is available for purchase at very reasonable sums at The Compound Gallery's online shop. 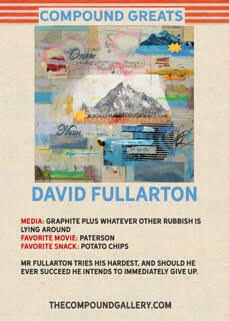 if you would like to exchange words with Mr. Fullarton please drop him an email at david.fullarton@gmail.com. The above publication is available through éditions Marguerite Waknine, based in Angoulême, France. It can be purchased online for €10.00 + shipping, but for some reason I can't link directly to the publication on their site. However if you go here and then click on the link that says 'le cabinet de dessins' it should take you right to the right page. Hopefully. The publication above is available on Blurb. It's self-published, and a few years old now, but it's still pretty nice. One day I fully intend to get round to putting together a new one. Those Blurb books are good quality, but a bit expensive. 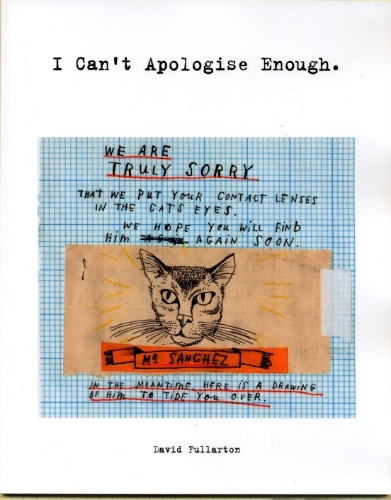 Also, confusingly, although it's title is "I Can't Apologise Enough' it doesn't contain any of the apology pieces. Not ideal, I know, but that's where we are. Recorded at The Compound Gallery in Oakland on Sunday, December 10th, 2017. Q and A with David Fullarton on the last day of his solo show "We Wish That We Were What We Once Were, Back When We Wanted to Be What We Are Now" at The Compound Gallery in Oakland, CA. This time Mr Fullarton shares the weird microphone that doesn't really work with fellow artists Alison Tharp and Liam Golden, at the closing of their three person show "Things That Happened and Things We Made Up" at the Compound Gallery in Oakland, CA on March 28th, 2014. That's entertainment, folks.